VATICAN CITY (CNS) — The decision to appoint Archbishop Theodore E. McCarrick to lead the Archdiocese of Washington and eventually to make him a cardinal went forward at the insistence of St. John Paul II’s inner circle despite reservations stemming from reports of misconduct, a new book claimed. The book, titled “Il Giorno del Giudizio” (“Judgment Day”), was released Nov. 6 and reconstructs the events leading to Archbishop McCarrick’s rise in the hierarchy while countering claims made by Archbishop Carlo Maria Vigano, former nuncio to the United States. Archbishop Vigano called on Pope Francis to resign and claimed he personally informed the pope about then-Cardinal McCarrick’s misdeeds. He also claimed that Pope Benedict XVI imposed sanctions on the cardinal because of allegations of sexual misconduct with and sexual harassment of seminarians. “We want to try to give an account of the facts but to also offer some perspective on the current crisis in which it is increasingly clear that some people — including some bishops — have forgotten what the church is, confusing it with a corporation and demanding the pope’s resignation as if he were a CEO,” Italian journalist Andrea Tornielli told Catholic News Service Nov. 9. 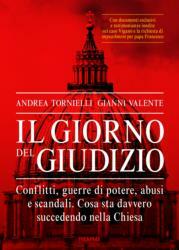 In the book, Tornielli and co-author Gianni Valente claimed that the “testimony” released Aug. 25 by Archbishop Vigano is riddled with inaccuracies and omissions on how the former cardinal rose through the ranks of the church hierarchy despite allegations of inappropriate behavior. Among other things, the book attempted to address Archbishop Vigano’s claim that St. John Paul II was “already very ill” in 2000 and so, perhaps, he did not make the decision to name Archbishop McCarrick to Washington and eventually make him a cardinal. “In that same year, aside from presiding at dozens of celebrations for the Jubilee Year, John Paul II visited Egypt, the Holy Land (Jordan, Israel and the territories under the Palestinian Authority) and then visited Fatima, to beatify Francisco and Jacinta Marto, two of three shepherd visionaries,” the book stated. It also noted that Cardinal Angelo Scola, who was appointed patriarch of Venice a year after Archbishop McCarrick’s appointment, recalled in his autobiography two conversations in 2001 with St. John Paul regarding his appointment to Venice. Citing an anonymous Vatican source, the book also disputed Cardinal Sodano’s role in Archbishop McCarrick’s promotion. “I absolutely do not recall (Cardinal) Sodano intervening in favor of McCarrick,” the source said. The source claimed that, on the contrary, Cardinal Sodano and Cardinal Giovanni Battista Re, then-prefect of the Congregation for Bishops, were against Archbishop McCarrick’s appointment. Instead, the decision was made by those in “the apartment,” a term used to describe St. John Paul II’s closest collaborators, bypassing the suggestions made by the Congregation for Bishops, the source alleged. My God another attempt to cover up the cover up of the coverup. NO ONE KNEW or heard about his beach house and the friendly seminarians he took their on weekends. And he didn’t have the power to name bishops who were friendly to his way of life. Certain elements within the Church have even attacked Raymond Arroyo from EWTN. I believe both authors had an agenda, my, my they got their book out quickly. Perhaps the authors believe all the allegations against McCarrick are just hurtful lies dreamed up by bad people, I don’t believe so I also believe hundreds of ordained men knew and hid the truth, but it’s the faithful that suffer not the Bishops.